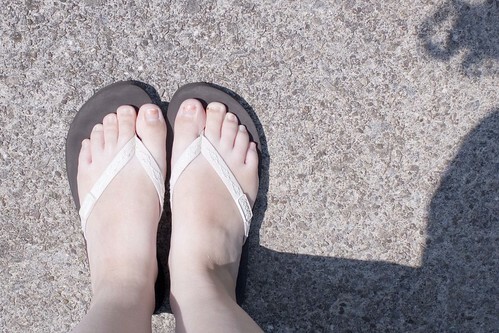 Once I hit warm weather, I switch over to using only flip flops or sandals. In general, I tend to use a rather ugly sports sandal or a Timberland type sandal which mostly work for comfort, but look hideous. Helen has pretty much mocked these sandals (deservedly). After looking at my shoes really well this year and noting that I had worn of the lining on the sole of the shoe, I decided it was time to splurge on a cute pair of feminine flip flops. Helen recommended both the J Crew fabric flip flops and the pair I got, which are the Reef Gingers. Actually, she did not recommend the Gingers for herself, but she said a person with a smaller foot might find them acceptable. Since I am the person who tries on sample shoes in stores and says, "Why do they put such large sizes out only? ", it was a safe bet that I could get a Ginger. I was disappointed when I first got them because I thought the fabric would be too rough between my toes. I am happy to say that I was totally wrong. I've worn the heck out of these shoes the last two weeks and I'm in love. They're cute, super light, comfortable, and I can wear them for long periods of time. They dry off quickly should you run through water in them, and they are great for wearing with a cotton dress or a pair of shorts and a tee. The only complaint I have about them is they run a little large. I got the size six to compensate for the fact that I have narrow size six and a half feet, but the shoes are a little big on me. Length wise they seem okay, but the fabric holding them to my feet is a little big and loose. Your mileage may vary as my mom, a size six wide foot, says they are way too tight. Please don't mind that I have horribly chipped nail polish only on my big toes in that picture! Wordless Wednesday #11 -- Water Fun?